Friends of JourneyCare may recognize Bob Roig. In his public persona as “Bob the DJ,” the Barrington resident has served as the entertainment at many special events that raise funds for patients who cannot afford care or for pediatric support services, including this year’s Decades Dance in April. For years, Bob has enjoyed getting to know JourneyCare supporters and watching them mix their generosity with some fun. 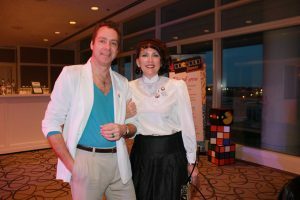 After years of hosting events like the Decades Dance for JourneyCare, Bob Roig, with his wife Joanne, knew to call the agency when his mother needed hospice care. But last July, Bob’s relationship with JourneyCare became more critical. It was France’s Bastille Day, July 14, when his mother, Bertha was celebrating the holiday of her birth country with his twin brothers. Though she already was living with diabetes and slight dementia, her children thought she was otherwise healthy. That day, Bertha suffered a stroke. Doctors learned the stroke occurred in her brain stem, leaving her without function on her left side and unable to speak. To help Bertha recover, Bob and his five siblings decided their mother should live at Symphony in Buffalo Grove, a JourneyCare partner agency, where she could receive the full-time care she needed. With the help of their rehabilitation staff, she was quickly able to speak again and regained considerable muscular movement. Yet the effects of the stroke enhanced Bertha’s dementia dramatically and, less than six months later, her health declined once more. Bob knew it was time for hospice care. Bertha remained among the familiar surroundings of Symphony as her JourneyCare team provided her plan of care. Because she was often experiencing panic attacks and agitation, her team decided she would benefit from a music vigil in her final days. JounrneyCare Music-Thanatologists Margaret Pasquesi and Tony Pederson both performed the vigil at her bedside, using harp and voice to soothe Bertha’s symptoms. Bob said the results were dramatic. Bertha died on January 24. 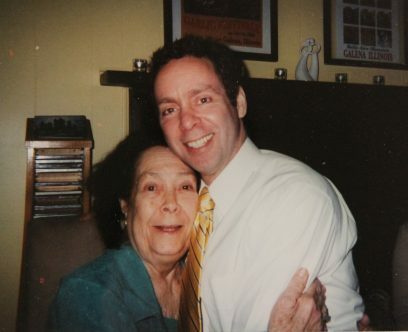 Though the loss wrenched the Roig family, Bob said hospice managed his mother’s illness, while saving him and his siblings from around-the-clock stress and anxiety.